South African all-rounder JP Duminy (34-years-old) has announced his retirement from ODIs, after the 2019 World Cup which shall start on 30th May 2019 in England. JP Duminy will play his third World Cup after 2011 and 2015. JP Duminy last home ODI would be South Africa’s fifth and final ODI against Sri Lanka on Saturday at Newlands. JP Duminy had earlier retired from Test and first-class cricket in 2017. 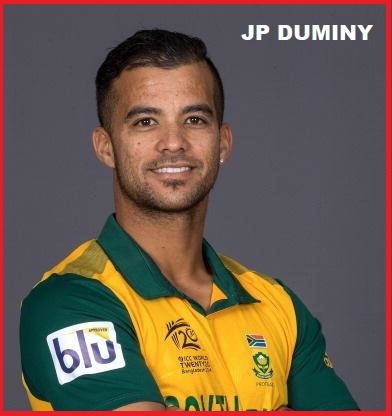 JP Duminy full name 'Jean-Paul Duminy' made his One Day International (ODI) debut vs Sri Lanka on 20 August 2004, T20I vs Bangladesh on 15th September 2007, and Test debut vs Australia on 17th December 2008. JP Duminy till date (March-2019) had played 193 ODIs, scoring 3,066 runs and 78 T20I scoring 581 runs. He also played 46 Test matches, scoring 1,601 runs till 2017 (till retirement). JP Duminy is an attacking Left-hand middle-over batsman and Right-arm offbreak Bowler. He is considered as best All Rounder of South Africa cricket team. JP Duminy in his International cricket career had smacked ‘10’ centuries (100s) and ‘35’ half-centuries (50s) respective to all the formats of cricket. He has taken '131' wickets in T20I, ODI & Test matches. JP Duminy played a smashing highest knock of 150 runs in ODI and 166 runs in Test cricket.